Big Clay Pot book cover. The first thing that appealed to me straight away when I began to read Big Clay Pot was the design of the book. It looks more like a book than a comic book. For starters, it has a cover that’s slightly harder than a normal comic book (not hard cover but almost like rough paper). It felt different than a comic book, not as flimsy and it also read differently to a comic book. On the official website it's classified as a graphic novel so we'll stick with that too. 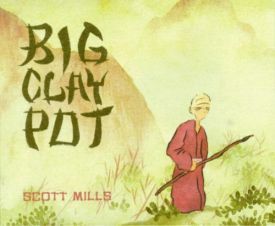 Big Clay Pot is the story of a Korean immigrant named Sun Kim who finds her way to Kyuushuu in Japan, circa 200 BC. During this time, many immigrants were coming to Japan. Sun Kim doesn’t get off to a great start though and finds herself in trouble with the locals sooner than expected. The unlikely hero of the story is introduced in the form of an elderly Japanese man who chases away the people harassing Sun Kim and together, they strike up a very unusual friendship. As the story progresses, we discover more about the characters of our story. The old man is named Kokoro, which translated means ‘Mind, Self, Soul’. He explains to Sun Kim that he is a simple man and tries to keep to himself after his wife Mei died in a storm. Even though the relationship between the two borders on something more than friendship, we begin to see the wonders of what human companionship can do, especially for two lonely people. The story is very moving and towards the end, very sad and left me with a bitter sweet feeling. The story telling in Big Clay Pot is wonderful. Not only is Scott Mills a great story teller but he has done a nice job with the layout of the book, especially with the use of the Japanese script on each page. This gives the book a look and feel of originality, further enhancing the books’ overall appeal. Once you understand the meaning of what ‘Big Clay Pot’ represents you will come to enjoy this story even more. The characters are very easy to warm to and the end result is a comic book that leaves you feeling sad yet somehow fulfilled and content all at once. How often do you feel moved by a graphic novel? I highly recommend this book to everyone, it's well worth the journey. The official website for Big Clay Pot can be found here.